Description of fields used when entering or importing archival descriptions using DACS in a CSV file or entering the data manually. At present, there is no DACS-based CSV template for importing descriptions into AtoM. However, because DACS maps so well to the International Council on Archives ‘ ISAD(G) standard, the ISAD CSV template can be used. The CSV mappings below will provide guidance on which ISAD CSV fields can be used to import your DACS-based descriptions into AtoM. DACS Rule refers to the rule from the applicable standard and/or the instructions provided by AtoM. DACS Rule At the highest level of a multilevel description or in a single level description, provide a unique identifier for the materials being described in accordance with the institution’s administrative control system. Optionally, devise unique identifiers at lower levels of a multilevel description. (DACS 2.1.3) The country and repository code will be automatically added from the linked repository record to form a full reference code. DACS Rule Select a level of description from the drop-down menu. Follow any relevant local or institutional guidelines in selecting the proper level of description. See DACS (2013) Chapter 1 for further guidance. DACS Rule Record dates of creation, record-keeping activity, publication, or broadcast (eventTypes) as appropriate to the materials being described. (DACS 2.4.3) The Date field (eventDates) can be used to enter free-text date information, including typographical marks to express approximation, uncertainty, or qualification. 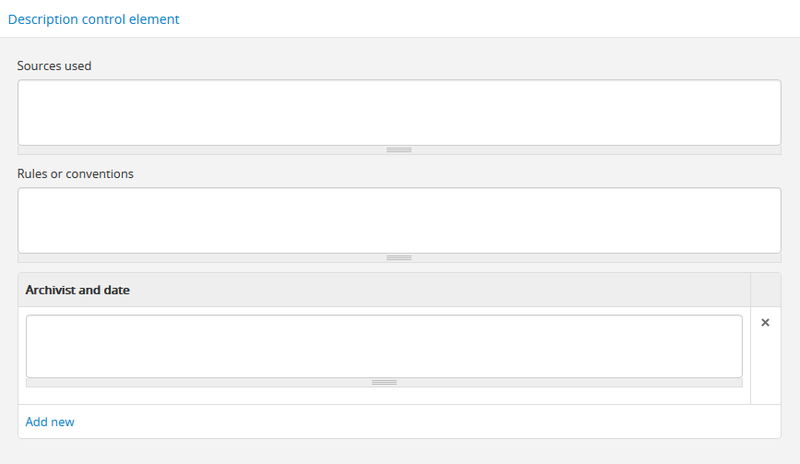 Use the start and end fields (eventStartDates and eventEndDates) to make the dates searchable. Do not use any qualifiers or typographical symbols in the start and end fields. Acceptable date formats: YYYYMMDD, YYYY-MM-DD, YYYY-MM, YYYY. DACS Rule Record the name(s) of the creator(s) identified in the name elevent in the devised title of the materials using standardized vocabularies or with rules for formulating standardized names (DACS 2.6.4). 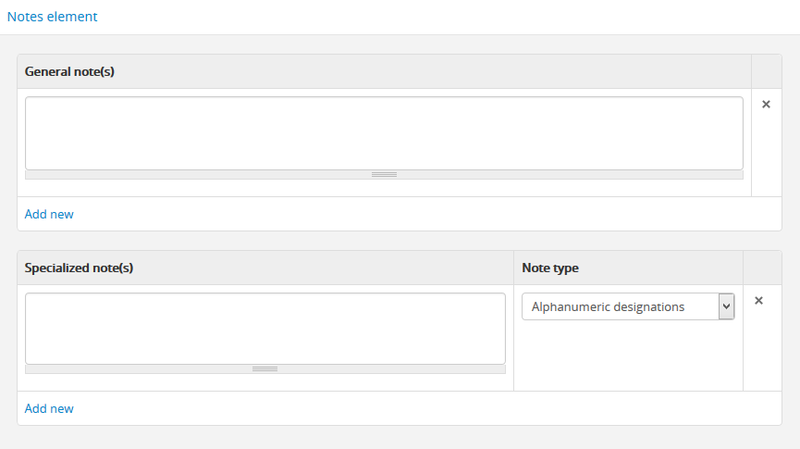 Search for an existing name in the authority records by typing the first few characters of the name. Alternatively, type a new name to create and link to a new authority record. These fields can be used to add lower levels to a collection level description. Click “Add new” to create as many child levels as necessary. DACS Rule Provide a unique identifier for the materials being described in accordance with the institution’s administrative control system. EAD See the EAD mappings in the related fields. DACS Rule: Record the level of this unit of description. DACS Rule: In the absence of a meaningful formal title, compose a brief title that uniquely identifies the material. DACS Rule: Record a date of creation. 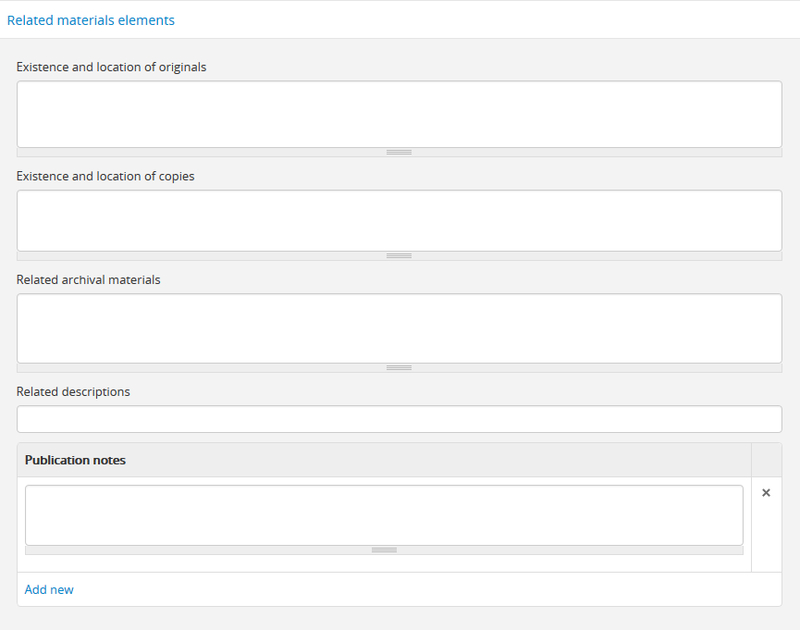 The data entry fields for the content and structure elements of the DACS archival description edit template. 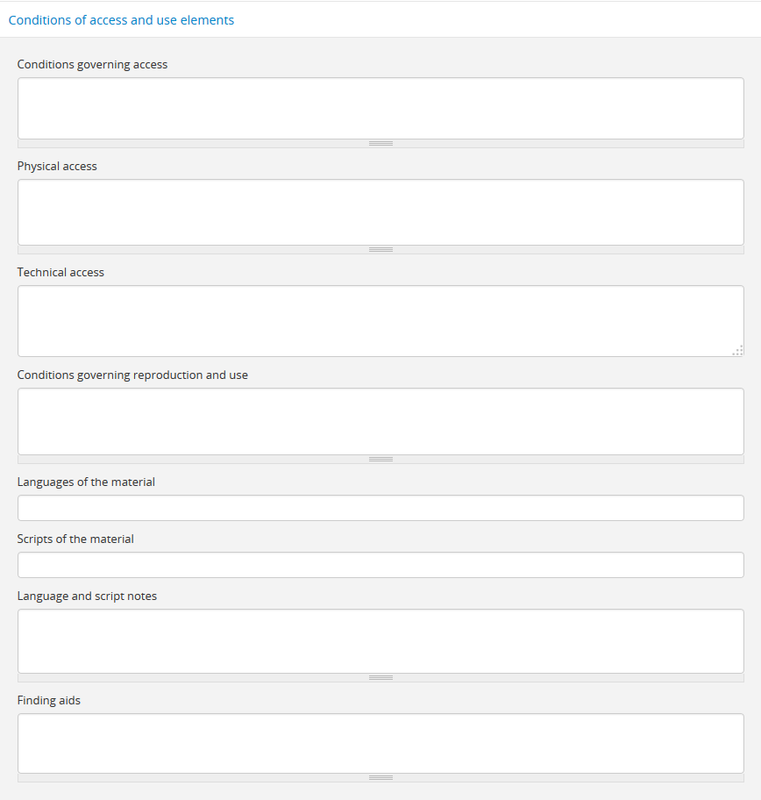 The data entry fields for the conditions of access and use elements of the DACS archival description edit template. EAD Not mapped to EAD. DACS Rule Record the scripts(s) of the materials being described. 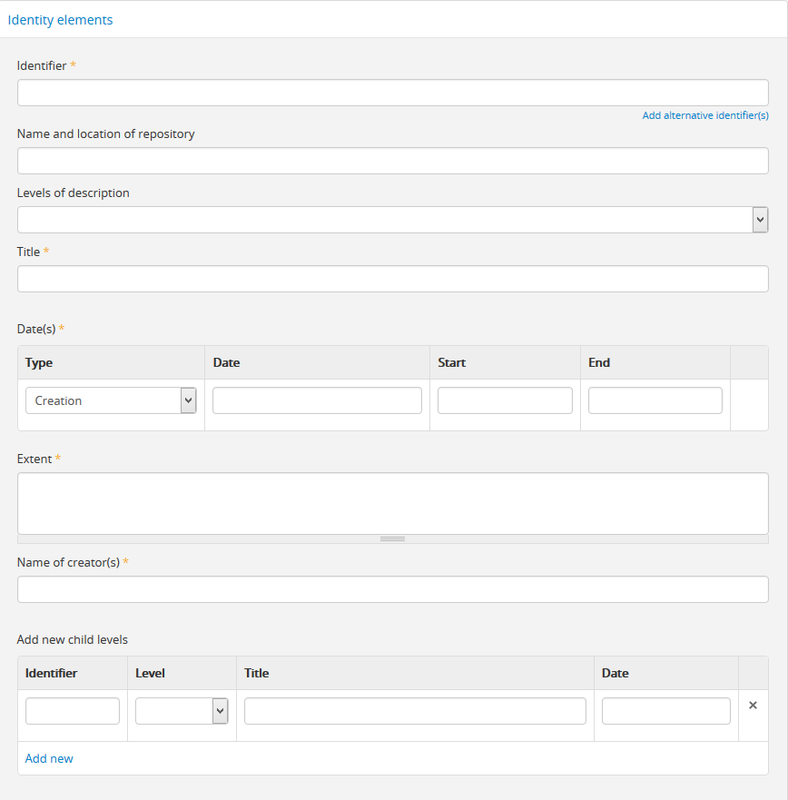 The data entry fields for the acquisition and appraisal elements of the DACS archival description edit template. 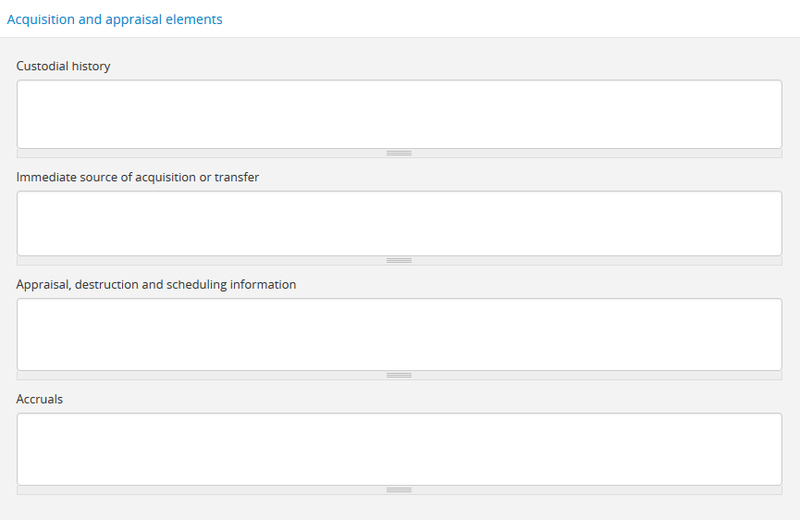 The data entry fields for the Related materials area. DACS Rule To create a relationship between this description and another description held in AtoM, begin typing the name of the related description and select it from the autocomplete drop-down menu when it appears below. Multiple relationships can be created. DACS Rule Select a note type from the drop-down menu and record, as needed, specialized information not accommodated by any of the defined elements of description, including Conservation (DACS 7.1.3), Citation (DACS 7.1.5), Alphanumeric designation (DACS 7.1.6), Variant title information (DACS 7.1.7), or Processing information (DACS 7.1.8). The data entry fields for the Description control area. The data entry fields for the Access points area.